swisslet: is it, is it wicked? is it, is it wicked? We almost ate at McDonalds. The other guys I was with were keen, but I haven't eaten in a McDonalds for over ten years now and I wasn't about to start now. I'm not singling out the Golden Arches especially, because in that time I haven't eaten in a Burger King or a KFC either. I'm no campaigner either: it's not that I particularly object to them or object to other people eating in them, it's just that I've made a personal decision that I would rather eat my food and spend my money somewhere else. It's entirely up to you if you want to feed yourself that stuff, but I've decided that I just plain don't want to. That's it. I used to eat them as much as the next man, but I woke up one day and decided that it was no longer for me. I don't remember them being horrible so much as lukewarm, slightly sweet smelling and never quite as tasty as I remembered them being. I can remember the first time I was taken to a McDonalds too: I was about six or seven years old and they had just opened their branch in the Central Milton Keynes shopping centre, and I was taken there as a treat with my friend. Over the next twenty years, I would often eat in the very same branch before heading over to the cinema to watch a film (well, before I swapped my allegiance to the BK up the mall instead. They did onion rings, you see). But I stopped eating that stuff completely ten years ago, and I haven't missed it at all. I'd just rather eat elsewhere. I wouldn't really have minded if my colleagues had insisted we go today, but I definitely would not have eaten anything there and I told them this. To be honest, they seemed a little surprised and suggested that perhaps it would do me good to have a Big Mac meal. After all, they said, there's nothing better after a night on the tiles. Well, I had a quiet night last night, but even if I did have the stinking hangover from hell, I wasn't about to feed myself a Happy Meal, no matter how enticing the latest movie tie-in toy might look. I'm sure that all of McDonald's claims about their ingredients being wonderful are probably true and they may have impeccable nutritional credentials*.... but that honestly doesn't make me want to eat them. Fill your faces if you like, but I'm out. I can hardly claim any high ground here: we had this conversation as we were drinking coffees from Costa, and we ended up eating our lunch in the Newark branch of Wetherspoons..... so it's not as though I'm only patronising high class Italian delicatessens with organic, artisanal pesto and coffee beans from an eco commune in Guatemala whilst sneering at the rest of you lumpen proles stuffing yourselves and your fat children with greasy fast food**. I just don't want to eat McDonalds thanks. ** I'd rather be doing this, clearly. As it happens, my lamb rogan josh served at the Wetherspoons pub as part of their Thursday Curry Club and served with a drink, rice, naan, two poppadoms and some mango chutney for the princely sum of £5.99 was perfectly acceptable, thanks very much. 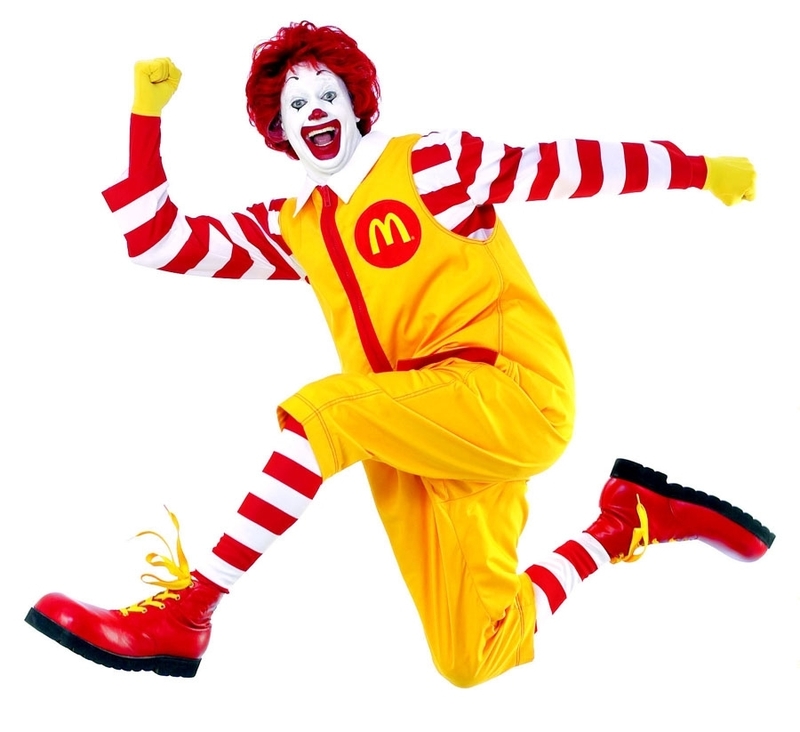 Whether you eat in McDonalds or not, we can at least all agree that the clown is just creepy though, right? What did he do to the Hamburglar anyway? Vigilante justice?